A discussion on the use of breathing techniques and mindfulness in golf at a recent ILGU Warm Weather Training week in Desert Springs, Spain, is what Aine Donegan (Woodstock) has attributed to her improved mental game and a boost in form since the beginning of 2019. Donegan, who has just turned 17, travelled with a team of ILGU High Performance Coaches as part of the Horizon Performance Panel to Spain in February which she admits was a very productive week. Having begun the year with disappointing results at the Andalucía Cup and the Portuguese International Ladies Amateur, Donegan’s fortune turned as she claimed the Carlow Scratch Cup in early March shortly after returning home from Desert Springs. 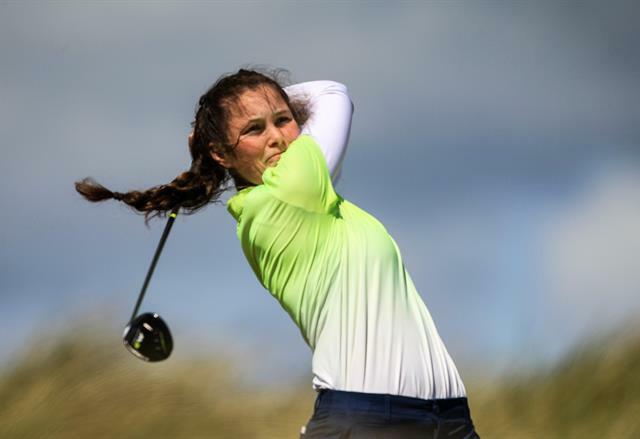 The Ennis native will join 104 other players representing 15 countries to compete for the Irish Girls’ Open Stroke Play Championship at Roganstown Hotel and Country Club and despite missing the cut on her previous two attempts at the event. Donegan has outlined some specific goals to ensure she finishes where she wants to be. In recent years it has been the International contingent who have been successful at the event. Ingrid Lindblad and Kajsa Arwefjall, both from Sweden, have taken the title on the last two occasions but Aine is confident that the first Irish win since Olivia Mehaffey (RCDL) in 2015 could be written in the stars this year. Aine was also keen to express her thoughts on the 20×20 Campaign which she believes will make a big difference to the coverage of women and girls’ sports. One third of the campaign aims to increase attendance at women’s sports events by 20% by 2020 and Donegan knows all about following her local women’s sports teams. If you have pledged to attend more female sports events in 2019, why not visit Roganstown from April 5th to 7th to view some of Europe’s future stars compete. Entry is free and all are welcome.